HGA’s Birmingham pipeline group has made significant progress on the 15-mile Florida Gas Turnpike Palmetto Road Relocation project through metropolitan Miami. Over the last few months, HGA has leveraged internal expertise with industry experience and local area knowledge to capture aerial survey and light detection and ranging (LIDAR) data and subsurface utility engineering (SUE) data to define the pipeline footprint within the existing electric transmission corridor. The aerial survey conducted in early January used rotary-wing aircraft (helicopters) to fly slow enough at low-altitude to allow high-resolution equipment with sub-centimeter accuracy to digitally scan the route corridor. 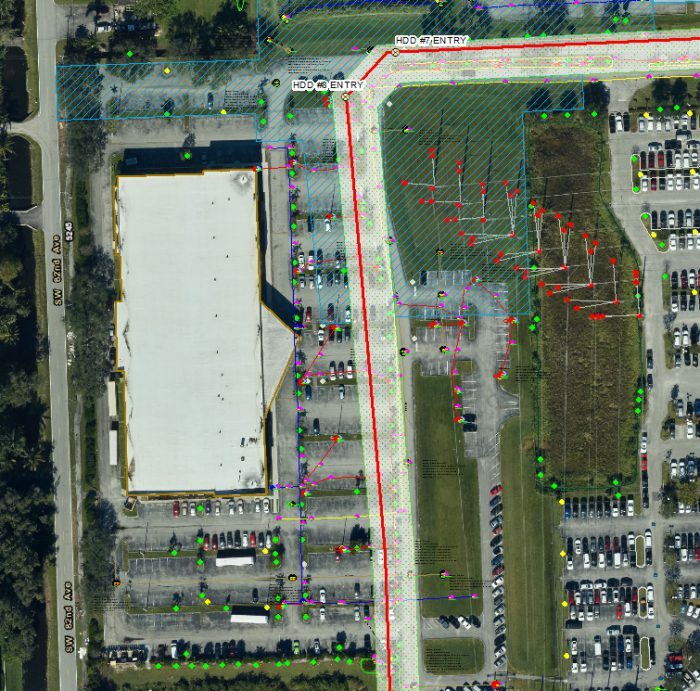 A planimetric cad file created from the aerial imagery and LIDAR point file identifies 6-inch contours and a multitude of features down to the size of a guy wire for electric transmission structures. A local firm is providing the location, type and size of the numerous foreign lines present inside the congested power line corridor where the relocated natural gas pipeline is to be installed. This organization has years of experience performing utility locates in the Miami area which has resulted in the development of an extensive utility database and working relationships with area utilities. Since responses to One-Call Notifications can be sporadic at times, without local area knowledge, relationships, and access to as-built utility drawings, many of these foreign lines would otherwise be undetected prior to construction. HGA’s engineers , designers and constructability experts are working diligently with the client to couple this valuable information with traditional survey data to identify potential interferences both belowground and above the surface. The route footprint of the pipeline centerline and associated workspace is being refined to confirm the footprint for the FERC filing, as well as avoid unpleasant surprises during construction that result in additional costs and schedule delays. Above is an example of the type of congestion, surface interferences and sub-surface conflicts are present in the attached image from the pipeline routing effort.